In the Hindi feature film “Fiza”, the protagonist visits Hajji Ali Dargah(Tomb) with her mother to pray for well being of her brother, Aman, who was missing after the riots broke down in the city . The scene shows that Fiza’s mother praying to Pir shaheb and in background you can listen to a beautiful sufi song sang by majestic A. R. Rehman. All the 3 leading actress of the film is seen in the Dargah. As we know now, Haji Ali has banned women to enter the Dargah. Had this film made now, the director would have not featured this scene in the Dargah. Also would have not asked Shaukat Ali to write this song and also definitely A.R. Rehman would had not sang this song. While entire nation is debating that the loss due to this ban , I am only thinking about these small cultural loss which we can’t even point in our debates. I may have missed the big picture but I think so I have made my point. I know as a foreigner, I’ll never fully understand the beauty of another’s culture, but I wanted to say that the Sufi song is indeed beautiful. Thank you for sharing. 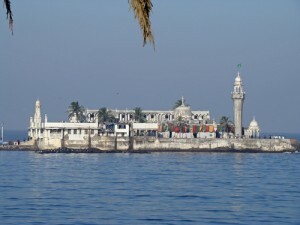 I wanted to visit Haji Ali not knowing that women are not allowed therein. Of course, I am not a Mumbaikar! But I love this song…. Its a shame the the Dargah’s community thinks that way. Yes, the song is lovely. I am glad that you also enjoy Sufi style of music.